Our exclusive Signature pool tables have been designed by us and are hand made by the world's leading manufacturers. Each table has competition grade gameplay thanks to tournament-standard parts. Take 5 Decisions to Buying the Right Pool Table: 1) American or English? 2) What Size? 3) Pool Table or Pool Dining Table? 4) What Style? 5) What Accessories? We guide you through each section to ensure you buy the right pool table for you. Our Signature Pool Tables range has been created in response to input from our customers on what they really want in a pool table. Through our experience of selling pool tables over many years, we’ve had a lot of questions and feedback from customers on the features they’re looking for. Having taken this feedback on board, we’ve created the Signature range of tables to cater to all needs and desires, and created a range of pool tables that are simply the best on the market. The entire Signature range has been designed and hand-built by the world's best manufacturers, using the best materials and fine workmanship that comes from years of experience. Each table is constructed to exacting specifications, giving you an assurance of quality that means you'll enjoy your table for many years after purchase. Our Signature Pool Tables incorporate an amazing range of finishes and styles, and can be fitted with a fantastic variety of cloths to suit any environment. We have chosen tables that can be customised to fit your needs while still retaining their unique styles. We stock an amazing choice of exclusive Signature pool tables, which now incorporates the beautiful Signature Pool Tables and the incredible Signature Luxury Pool Tables. The Signature Luxury Pool Tables are all displayed below but can be seen on their own page - please click here to see the Signature Luxury Pool Table range. Every table in the Signature range has its own unique advantages and stylistic touches, and these are each summarised in the product pages here on our site. Advantages such as chrome metal corner caps, high-quality laminate finishes, competition grade cushion rubber and many more are all detailed within the products' individual pages. We also incorporate pool dining tables for those looking to get more flexibility from their pool table, and offer American pool for customers seeking a different style of play. If you would like to discuss these features in more detail then please contact our staff on 0800 622 6464 and they will be happy to talk through your options. For more information on any of these tables, please click one of the links below to go straight to the relevant product information. All of our Signature Pool Tables come complete with free delivery and free accessories. When your new table arrives, you'll have everything you need to get started with a fantastic game. We understand with busy schedules, family life and work commitments not everyone can visit our showrooms. Buying a pool table is generally something you will only do once in your life, so its important to make the right choice. We at Home Leisure Direct understand this completely. If you are unsure about cloth colours or wood finishes we can send you samples out free of charge to help you make that decision stress free. If you are concerned about your space, size of the table or whether or not a table will fit in your space, then you can either download any of our “Will It Fit?” guides or call the team who will happily help you over the phone. We will never tell you an item will fit just to get a sale. You can trust us to offer you honest advice, all of the time, so that there are no unwanted surprises on your delivery day. If you would like to check the availability of any of our tables, please call our expert team on 0800 622 6464 or 01454 413636 and we will be happy to advise on timeframes. Every table in the Signature Pool Tables range comes backed by a 12 months manufacturer's guarantee. This covers any manufacturing defects to the table, and top if supplied. If you have any questions about any of the pool tables we sell, or about any of our other products, please give us a call on 0800 622 6464 or 01454 413636 and one of our friendly expert advisors will be happy to help you. Stressful city centre driving and expensive places to park are not part of the Home Leisure Direct experience. Instead we have three converted stone built barns, one of which was an old milking parlour, in the idyllic countryside where you will be greeted by a member of our friendly, knowledgeable team with free parking right outside the door. We believe visiting us will be the most fun showroom visit you will ever have. Whether it be a pool table, a pool table that converts into a dining table or one of our other fantastic games room products, we look forward to welcoming you soon with a freshly brewed cup of coffee and a truly enjoyable experience. Take our Showroom Tour to see what awaits you. Buying a pool table is a real investment, so let us make that easier for you. We offer Interest Free Credit (0% APR) on our luxury range of pool tables, Buy Now Pay Later and low interest payments (19.9% APR) across the rest of our range with no deposit to pay upfront and flexible payment terms (subject to acceptance). Please see our terms and conditions for more details. The jewel in Home Leisure Direct's crown is that we are one of the only pool table retailers who carry out our own delivery and installations. We do this to ensure we can provide a complete end to end service for our customers and a truly bespoke level of service. We have a dedicated warehouse and an experienced team of qualified engineers who cover the whole country. They are able to install pool tables in a ground floor room right up to a 27th floor penthouse in the centre of London (as long as you have a lift!). One of our most interesting installations was a beautiful custom pool table on a super-yacht, in the Mediterranean sea, so we try to accommodate even the most unusual requests. To help you further with your choice of pool table and to better understand all the features and options available these useful articles and videos will help you. Pool Table Buying Advice - over 20 articles and videos covering everything from the accessories that come with the tables and which additional items you may need, to playing snooker on your pool table. How to Play Pool - our expert pro players Gareth Potts (four times World 8 Ball Pool Champion) and Karl Boyes (four times Mosconi Cup Winner) explain how to play pool, from the basics right up to handling the most difficult shots and match tactics. The differences between American and English Pool - we explain every difference between the two types of pool table, there are quite a few so this can be really helpful when you are deciding which type will be best for you. What size of pool table are used in leagues? - many customers want to ensure they buy the right size pool table to match what they will have played on in pubs or pool halls. In this video we explain the different sizes used in most common competitions. 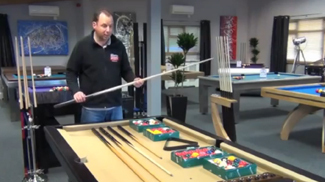 How to measure your space to fit a pool table - one of the questions we are most often asked is will the pool table fit into the room, in this video we explain how to measure everything properly and make sure you have enough room to cue. Games Room Designer - this powerful browser-based app is free for you to use to design your floor plan and where to situate all the items in your games room, in fact in any room of your house. It's a breeze to use, you can save your work, print it out and share it with others by email. Have Serious Fun choosing your new pool table. Of course, if you need any help please call us on 01454 413636 or 0800 622 6464, or you can email us sales@homeleisuredirect.com, or why not visit our amazing showrooms - here's How to Find Us.